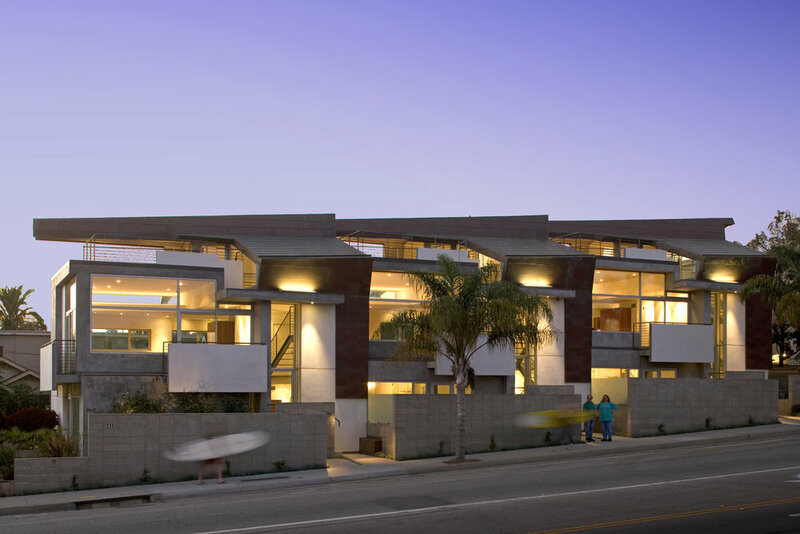 The design for Ocean Park Housing project takes full advantage of the site, climate and solar conditions while providing a culturally relevant housing project among older traditional single and multifamily buildings. The challenge is to bridge the gap between City Codes and Contemporary Design by designing a unique roof system in a city that requires roofs over 23 feet to be pitched. The architectural team pushed the envelope and the interpretation of the code to the greatest extent possible. The roof deck heights were set at 23 feet by code. The mezzanine space above the living area exceeded the limit and forced the design team into an aggressive solution of cutting, shaping, manipulating and interpreting the standards set by the city. The design responds to cultural, regional and city requirements and to its context, climate and solar conditions. The building is designed as a transparent volume on the public level to take full advantage of solar conditions and natural light throughout the year. Versatile outdoor and indoor living areas as well as transparent divisions between patios, gardens and indoor spaces create a transparent transition between indoor and outdoor spaces. The large expanses of glass allow the occupants to enjoy natural light and ventilation while maintaining a comfortable temperature. Access to natural ventilation combined with the concrete block walls and floors allow the units to stay moderately cool during the hottest days of the summer. In the winter months, the concrete surfaces release the sun’s energy to maintain a comfortable interior temperature.